Can anyone honestly say that they do not overspend when shopping at Costco? Don’t get me wrong. I love Costco. But despite my best intentions, and making “the list”, it is so easy to get carried away. I have friends that are no longer members because of this. Would you believe I have found articles that will provide you with tips on how not to overspend at Costco? Last week, I went to Costco -list in hand and eyes focused on the list. My mission was clear. Only buy what was on the list. Everything was going according to plan, until I spotted them. In fact, I did not want to resist. Pomegranates are one of my favorite fruits. They are only in season from October to January, hence they are referred to as ” the jewel of winter”. So, it was now or never! If you would like to know more about pomegranates, I created a short video on How to Easily Remove Pomegranate Seeds. Just click on the link to view it. Pomegranate, the superfruit: A great source of Vitamin K, vitamin C and fiber; not to mention folate, potassium and so much more. 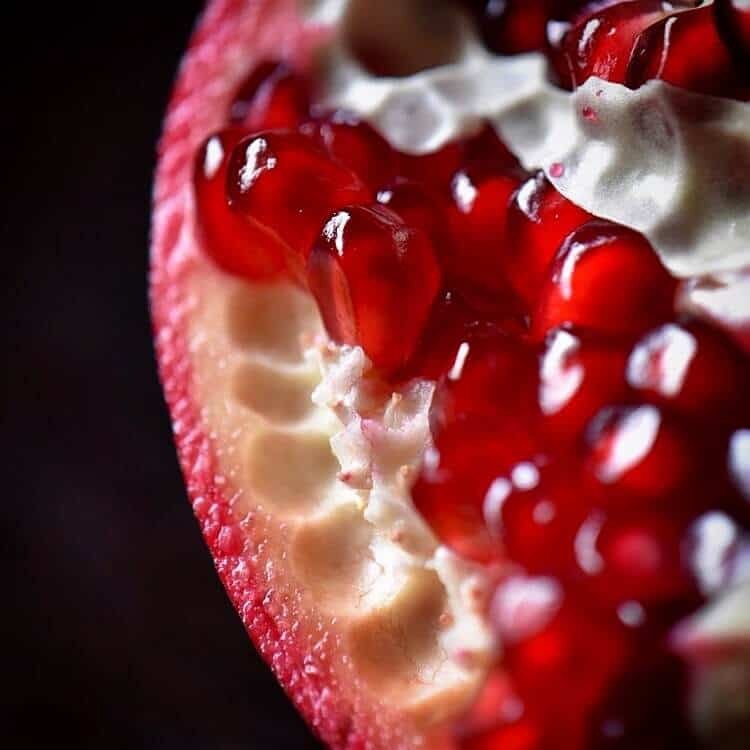 You really cannot go wrong with pomegranates. Who would guess that hidden under that tough exterior are hundreds of jewel-like seeds (referred to as arils) that provide flavorful bursts of tart-sweet juice and so much nutrition? Pomegranates are great as a snack, but today we are going to combine them with another one of my favorite foods: fregola. Fregola, as you probably know, originates from the south side of Sardinia (in Italy). It has often been compared to Israeli couscous, but with a wonderful nutty flavor. Once you begin to experiment with this type of pasta, you will find that the nutty flavor, combined with its chewy texture makes fregola an ideal ingredient in salads. Here are some other salads that highlight the contribution of fregola in salads. The first is a Fregola Salad with Roasted Red Pepper where the anise-like flavor of fennel and the smokiness of the roasted red pepper is combined with the nuttiness of fregola. This Mediterranean inspired salad recipe is another great salad! Fregola is combined with lentils, sun dried tomatoes and black olives. As an added bonus, this healthy fregola salad with lentils can be eaten hot, cold or at room temperature. So you can well imagine that a recipe entitled Simple Fregola Spinach Pomegranate Winter Salad has a lot going for it. I will usually cook the fregola until there is still a chew to it. So, the time on my package indicates the cook time as 14-17 minutes. I will cook the fregola for about 10-12 minutes. Once the fregola has cooled off, I add the rest of the ingredients (spinach, parsley, toasted walnuts) and combine them all together. I will then drizzle the salad with a balsamic vinaigrette. Finally, the pomegranate arils are gently folded in. Just in case you are wondering, leftovers make great packed lunches. A few years ago, I purchased a cookbook by Diane Henry called Plenty. If you like fresh, whole and unprocessed foods, that are in season, this cookbook is for you. Ms. Henry is truly a wizard at food combinations that actually create tastes explosions! One of the first recipes I made from this book was a Barley, Parsley and Pomegranate Salad recipe. Ms. Henry actually has a website where you can find a few of her recipes (if interested, you can follow the link for the original recipe). As much as I love barley, I love fregola more. I thought it would be interesting to replace the barley with fregola and include a balsamic vinaigrette. 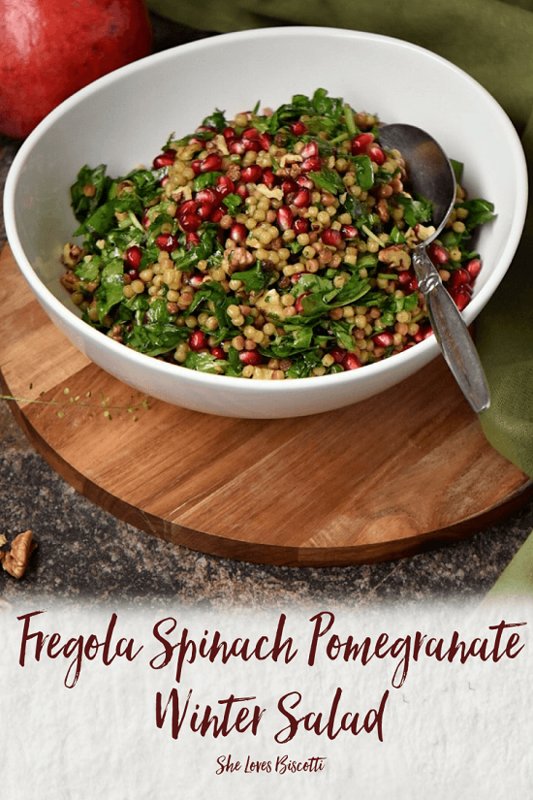 Needless to say, if I am sharing this recipe with all of you, it is because this Simple Fregola Spinach Pomegranate Winter Salad is a big hit in my family. So, if you happen to be at Costco, look for the pomegranates and enjoy them. The nutty flavor of fregola pairs beautifully with the tart-sweet bursts from the pomegranate in this Simple Fregola Spinach Pomegranate Winter Salad recipe. Stir and cook fregola for approximately 12 minutes or until al dente. Add about 1 tablespoon of olive oil to keep the fregola from drying out. When the fregola has cooled to room temperature, add the parsley, spinach, walnuts. Combine gently together. In a separate bowl, whisk together the olive oil, vinegar, honey, dry mustard and salt and pepper to make the balsamic vinaigrette. Gently combine the pomegranate seeds. I had the same experience at Costco this past weekend, bringing home the big crate of pomegranites. This dish would be welcome on any Thanksgiving table, so colorful and I am certain full of flavor. ooh..I do love how this recipe is able to infuse pomegranate into a salad! I actually have never had fregola before! I will need to try this. I definitely need some more lunch options that are easy to put together. I like that pasta brand “Rustichella d’Abruzzo”! And I like the flavor and texture of fregola. We need to make it more, especially in this beautiful combination with spinach, walnuts, and the lovely pomegranate. Such great colors too! Thanks for sharing this recipe Maria. It looks so festive! And I’ve never tried cooking with fregola before so I think I’ll start with this! This is my kind of salad, Maria! So healthy and versatile. I love pomegranate as well. Thank you for the inspiration. I love hearty winter salads like this with vegetables and fruit included. Yours looks perfect for a traditional Christmas with the red and green in there!